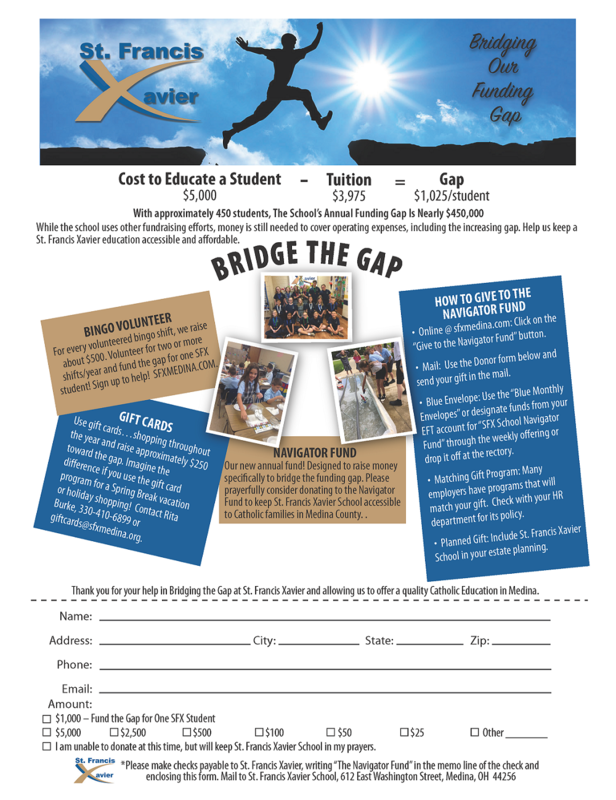 The Navigator Fund is an annual fund benefiting St. Francis Xavier School. Support helps to bridge the gap that exists between tuition and the total expense required to operate our school. We strive to keep tuition affordable so that all families can experience an exceptional, Catholic education for their children. However, tuition only covers about 80% of the actual cost to educate a student. We are relying on the generosity of donors for the additional 20%. St. Francis Xavier School is a 501(c)(3) charitable institution. Double your gift! Many employers will match gifts given to non-profit schools such as St. Francis Xavier School. So when you donate to The Navigator Fund, all you have to do is check with your employer’s personnel office to obtain the necessary form, complete it and send it to St. Francis Xavier with your contribution. Watch this video from committee chairperson Mr. Kevin Sloan on how we can BRIDGE the GAP with THE NAVIGATOR FUND. For all Parishioners, St. Francis Xavier offers an alternative to writing a weekly or monthly check. Join our Automated Giving Program and have your financial offering transferred directly to the parish account. Q: Is The Navigator Fund an Annual Fund, a Capital Campaign or an Endowment Campaign? A: The Navigator Fund is an annual fund. Annual funds are commonly utilized at private schools as a method to offset the difference in operating revenue (tuition) and the operating expenses required to run the school each year. At SFX tuition only covers approximately 80% of the actual cost to educate a student. The remaining 20% is a gap in funding. Bridging this gap through strategic fundraising creates the ability to keep tuition affordable for more families. As an annual fund, The Navigator Fund will provide funding for each school year. All contributions will be utilized in the same school year to support current operating expenses. The Navigator Fund is not a capital campaign or an endowment. Capital campaigns are fundraising efforts targeted to raise funds for a specific project. They usually extend over multiple years to complete. For example, a capital campaign could be used to generate funds to construct a new building or an expansion of an existing building. Endowments are financial funds non-profit organizations establish to provide support over an extended period of time. Donations to endowments typically are not used immediately. Rather, contributions are invested and the interest earned from the investments is released periodically to benefit the organization. Q: Why start The Navigator Fund now? A: As with other organizations, SFX School is impacted by increasing expenses, including rising healthcare costs. In past years the gaps in funding have been primarily subsidized by SFX parish. Providing the school subsidiary has limited the parish’s financial flexibility to provide support for parish ministries, as well as, for various capital expenditures required to maintain the SFX campus. The Navigator Fund provides financial support to maintain an excellent, Catholic educational experience for our children while keeping tuition affordable and providing increased financial flexibility for the parish. Q: Will there still be a Magazine Drive? A: No. Your support of The Navigator Fund provides the ability to retire the magazine drive at SFX. Q: How does The Navigator Fund differ from PTA fundraising, “We Give Catholic”, and The Boosterthon Fun Run? A: The Navigator Fund provides financial support for the school’s general operating expenses. These include teacher/staff salaries and benefits, and ongoing school programming and administrative expenses. The PTA (Parent Teacher Association) fundraising provides support to enrich our student and teachers experience in and out of the classroom throughout the school year. We Give Catholic is an online day of giving coordinated by The Diocese of Cleveland. Contributions are provided to the Catholic school, parish or organization of the donor’s choice. These contributions are traditionally earmarked for a specific purpose by the receiving organization. At SFX, We Give Catholic has benefited our school. In 2016, contributions were used to replace school lockers. In 2017, contributions were used to create the new X-Stream Launch Lab in the school. In 2018, We Give Catholic will be held on Tuesday November 27th and the contributions will be used to boost SFX’s “green” initiatives by replacing the water fountains in the school, gym and church basement (school cafeteria) with water bottle filling stations. Proceeds from SFX School’s Boosterthon Fun Run provide support for SFX School to enhance the school. These contributions are collected through pledges students receive from family and friends to run laps as part of broader nine day program each spring focused on fitness, leadership and character. Proceeds from the 2017 Boosterthon Fun Run were used to install/upgrade a security system throughout SFX to support the safety and security of the students, teachers and staff. Q: Are school parents the only people who can contribute to The Navigator Fund? A: No. Everyone in the SFX community is a stakeholder in our school, including current students and parents, grandparents, SFX parishioners, alumni, our supporting businesses and special friends. The Navigator Fund seeks to connect all of these invested groups for the continued success of our school. We ask support from all these stakeholders, who all have unique interests in keeping our school operating at the highest levels, or as a way to say thank you for providing a springboard for success from SFX alumni who have entered the workforce. Every gift matters. Q: Can I contribute throughout the school year, even if I already sent in a contribution? A: Yes. Even though many parents responded early on in order to qualify their student(s) to earn the dress down day, it does not prevent additional contributions to The Navigator Fund throughout the year. Q: Who do I make my check out to? A: Checks can be made payable to St. Francis Xavier, with writing “The Navigator Fund” in the memo line. Please include the form on the school website along with your contribution for tracking purposes. Q: How much should I consider giving? A: We hope every parent will be as generous as possible. Donations have ranged from $25 to $5,000. The current gap in funding is approximately $1,025 per student. All charitable giving, according to our stewardship way of life, should be sacrificial, generous and proportional to the gifts that God has given to us. Every gift is appreciated and benefits our school community. Q: Why not raise tuition instead of asking for support? A: SFX attempts to keep tuition as low as possible so as many Catholic families as possible are able to afford a Catholic elementary education in Medina. Raising tuition would unintentionally restrict the number of families who could attend the school. At the same time, SFX is committed to maintain the excellence of our academic programs. Strategic fundraising support assists us achieve both goals. Q: Does The Navigator Fund accept matching gifts?